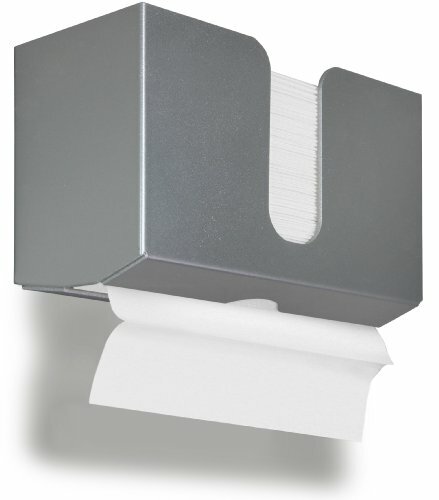 The TrippNT 51917 Silver Metallic Dual Dispensing Paper Towel Holder is a plastic wall mount paper towel holder that dispenses one towel at a time from the bottom and multiple towels from the top, and is suitable for use in office, commercial, educational, and other facilities. The towel holder is made of PETG (polyethylene terephthalate glycol) to resist cracking and impact stress. 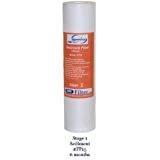 It is compatible with C-, Z-, and multifold paper towels (sold separately) up to 10.5 inches long. It has a vertical opening in the front to facilitate dispensing towels from the top and to provide a visual indication of the towel supply. The towel holder weighs 1 lb., can hold approximately 150 paper towels, and measures 6 x 11 x 4 inches (H x W x D). (H is height, the vertical distance from lowest to highest point; W is width, the horizontal distance from left to right; D is depth, the horizontal distance from front to back.) It can be installed on walls or mirrors with adhesive mounting tape (included) and has keyholes in the back for a screw mount installation. Mounting hardware is sold separately. TrippNT manufactures storage products, dispensers, carts, workstations, and shields for scientific laboratory applications. The company, founded in 1993, is headquartered in Kansas City, MO.